Mill Creek Park was bustling with colorful saris, Indian food and Sikh and non-Sikhs alike. This Sunday, the Sikh Peace Parade started out at Mill Creek Park and its attendees strolled down 18th Street, celebrating the birth of Sikhism. Several members follow behind a float during the Sikh Peace Parade which started at Mill Creek Park. The Peace Parade isn't only a Bakersfield event. 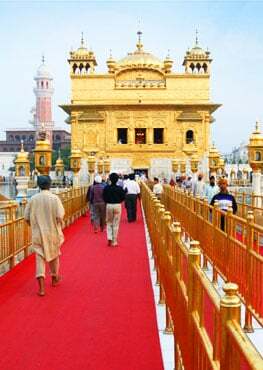 It marks the day the Sikhs' 10th guru created the Khalsa Panth, or the community of initiated Sikhs. Sikhs donate food to the community and come together to celebrate, just as they do daily at each of their temples throughout the city. Chris Parlier said the Sikh community in Bakersfield is very intertwined with Bakersfield's community as a whole. Parlier is the Bakersfield City councilman for Ward 7, which encompasses a bulk of the Sikh temples in Bakersfield. "They're an integral part of the community, part of the fabric of Bakersfield," Parlier said. Parade-goer Dr. Munkand Sandhu emigrated to Bakersfield several years ago and is happy to call Bakersfield home. He said being a practicing Sikh in Bakersfield really makes a mark in the community. "It feels really good, we can give more skills," Sandhu said. "I don't want to say Bakersfield is like heaven, but it's almost like heaven." Mayor Karen Goh, left, helps present an award by the Sikh Community to John Hefner, second from right, a Sister City Resident. The Sikhs of Bakersfield gave Parlier an award for helping to create a new turn signal near one of the Sikh's temples, where Stine Road and Hoskings Avenue intersect. This effort not only benefited the Sikh community, but also Bakersfield as a whole, he said. "My children grew up with Sikhs; they're extremely giving," Parlier said. "We are one community." Mayor Karen Goh accepts an award by the Sikh Community for Andy Vidak before the Sikh Peace Parade begins. In addition to providing free food at any one of their temples every day, Parlier said the Sikhs offered meals for anyone impacted by the Lake Isabella fires and they would transport them there. Recently, the Sikh community has advocated for the renaming of Stonecreek Park after a Sikh human rights activist, Jaswant Singh Khalra. Jasuir Pangalia, a Sikh who was at the Peace Parade, said he's indifferent to the renaming of the park. "Same name, different name, it's the same community," Pangalia said. A large crowd attended the award presentation by the Sikh Community held at Mill Creek Park before the parade starts. But Jasbir Riar, another Sikh who has been more involved in the park renaming effort, said renaming the park will have younger generations questioning the identity of Jaswant Singh, which could help educate them on Sikh history. Park renamed or not, Riar echoes the main goal of what it means to be a Sikh in Bakersfield — it's really not that different than being a Sikh anywhere else. "Sikh or not Sikh, we help anyone in need," Riar said. Mike Maggard Kern County Third District Supervisor says a few words to teh audience of the Sikh Peace Parade starting at Mill Creek Park.